You’ve got til the end of the month to bid on a whole bunch of celebrity experiences for charity in the Robert F. Kennedy Center for Justice and Human Rights Auction. The RFK Center Auction through charitybuzz.com includes such items on which to bids as: Meet Oprah backstage after 4 VIP tickets to taping of the final season of her show; spend a week at Vogue with Anna Wintour; 2 all access passes to the TriBeCa Film Festival and coffee with Robert DeNiro; one month internship with Diane Von Furstenberg; tix and backstage passes/meeting to Alicia Keys concert; meet Anderson Cooper on the set of 360; lemonade and cookies with Martha Stewart in her gardens; be Elton John’s guest at his famous post-Oscar party; and more from walk-on parts in major motion pictures to behind the scenes tours on TV show sets, the Statue of Liberty, and even playing football with Reggie Bush. All in support of justice and advancing human rights for all. One of the most fascinating RFK Center projects is Speak Truth to Power (STTP) is a program dedicated to promoting awareness of human rights. Through the combined power of arts and education, STTP seeks to proactively engage the general public, bringing human rights activists and their work into contact with ever-increasing audiences. Bid now–you’ll never regret supporting this work. Twitter seems to be a more amazing tool than I’ve previously been willing to admit–I’m considering Twitter to make quick updates and find additional ways to reach out with information. 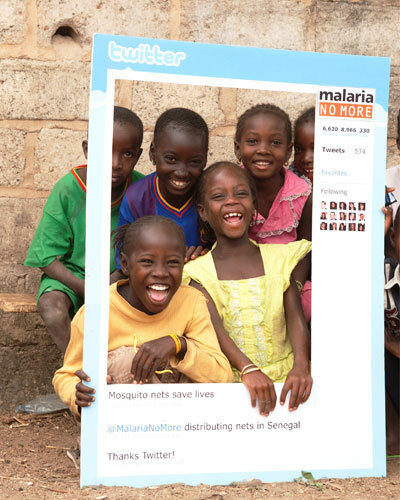 Other folks, far more social media advanced than I, are currently Tweeting to end malaria. There is now an official Malaria Envoy of celebrities and leaders of business and media who are using Twitter to raise awareness. Anderson Cooper, Arianna Huffington, Larry King, Ryan Seacrest, Sean Combs, Alyssa Milano, Ashton Kutcher—they are all part of the Envoy team. It is the UN Secretary General’s goal that this year, 2010, we, as a planet, achieve 100% net coverage, so every person in a malaria zone has the possibility to sleep beneath a mosquito net. It is possible to get all those nets distributed out there, but we have to step it up. That ramping up of efforts will get us closer to the other time-pegged goal in 2015, when the plan is to bring malaria deaths down as close to zero as is scientifically possible. World Malaria Day is not until April 25, but it is not too soon to use the social media tools in which you are already conversant to get your followers/friends/and fans active in the cause. Tweet or update your status today–it actually saves lives. I have to say, I’m kind of driven up a wall by Twitter. As soon as I say that I’m sure I’ll be a Twittering fool in the blink of an eye, but thus far it has seemed to me like all the parts of Facebook that I don’t like. I truly don’t care what my friends or followers or followees had for breakfast or thought of the outfit Lady Gaga wore on the red carpet. There are, however, some amazing things that have come of the Twitter Revolution. Last year, for World Malaria Day, Ashton Kutcher and CNN were in a furious race to see who could first get a million followers on the social networking site. Ashton won, and to celebrate his victory over the media giant network, he vowed to send 10,000 mosquito nets, via Malaria No More, to Africa to fight the disease. Those nets were sent and have now all been distributed, with plenty of others. Ashton’s Twitter posting became the world’s most re-tweeted message on World Malaria Day, and resulted in many others making direct donations, so that the total number of “Twitter Nets” was 89,724! Other high-profile Tweeters got involved: Oprah, Anderson Cooper, Sean Diddy Combs, and Ryan Seacrest, among others. Who, in your network of friends, is willing to join you in making a difference in the world? I missed the Thanksgiving broadcast of the CNN Heroes All-Star Tribute when some of our world’s most tremendous changers were honored for the grassroots efforts they have made creating new ways to make a difference (it’ll be re-broadcast on Christmas Day). From the Girl Child Network Worldwide that mobilizes young women around the world to push past artificial limitations placed on them by cultures and truly achieve their potential…to the self-explanatory Wheelchairs for Iraqi Kids…to Wine to Water trying to bring safe drinking water to all the world’s people…these folks who came up with these ideas, these heroes, are the very definition of inspiring. There’s a heartening array here of “fountains” from which to draw your motivation to reach out. It would be pretty difficult to work your way through the links on the CNN Heroes web page to each of the 2009 Heroes’ project websites and NOT find something to light your fire. What would launch you out of bed tomorrow morning? Devotion to kids? Medical and health enhancement? Solving environmental issues? Supporting a young person who has come up with solutions? Reaching out locally within immediate communities? It is all here. Spend some time, a few minutes when you have them, and search for the synchronicity you absolutely know is there, waiting for you. Lyrics to Carrie Underwood’s “Change” after the jump.